This sample resume for a radiologic technologist shows how you can provide a powerful portrayal of your radiography qualifications. Healthcare is a booming, which is great news for someone like you who's looking to land a job in the industry. To be the successful candidate for radiologic technologist jobs, it helps to have a comprehensive resume. Need inspiration? 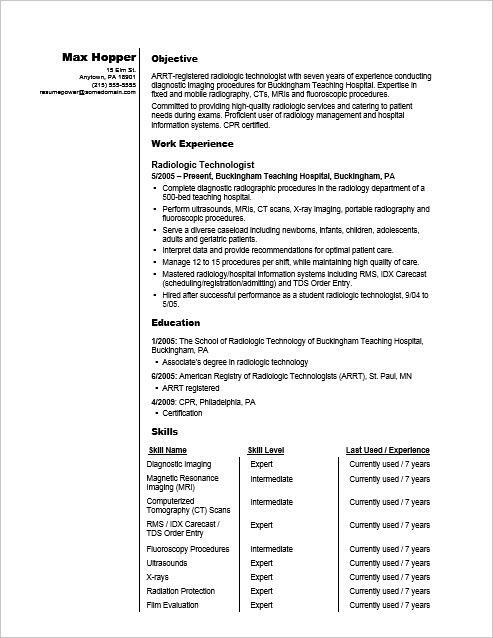 Check out the sample resume for a radiologic technologist below and download the radiography professional resume template in Word. Jobs for radiologic technologists are projected to grow by 13% (or 30,300 jobs) from 2016 through 2026, which is faster than average, according to the Bureau of Labor Statistics (BLS). You'll find the highest level of employment for this job in the following states: California, Texas, Florida, New York, and Pennsylvania; and in the following metropolitan areas: New York City, Los Angeles, Chicago, Houston, and Dallas. As a radiologic technologist, you can expect to earn a median wage of $60,070 per year, or $28.88 per hour, according to the BLS. Additionally, you can learn about healthcare careers on Monster. ARRT-registered radiologic technologist with seven years of experience conducting diagnostic imaging procedures for Buckingham Teaching Hospital. Expertise in fixed and mobile radiography, CTs, MRIs and fluoroscopic procedures. Committed to providing high-quality radiologic services and catering to patient needs during exams. Proficient user of radiology management and hospital information systems. CPR certified. Complete diagnostic radiographic procedures in the radiology department of a 500-bed teaching hospital. Perform ultrasounds, MRIs, CT scans, X-ray imaging, portable radiography and fluoroscopic procedures. Serve a diverse caseload including newborns, infants, children, adolescents, adults and geriatric patients. Interpret data and provide recommendations for optimal patient care. Manage 12 to 15 procedures per shift, while maintaining high quality of care. Mastered radiology/hospital information systems including RMS, IDX Carecast (scheduling/registration/admitting) and TDS Order Entry. Hired after successful performance as a student radiologic technologist, 9/04 to 5/05. As a radiologic technologist, you know the importance of professional screenings. Well, when it comes to your job search, getting a professional to screen your resume is also important (albeit not in the same way). Could you use some help with that? Get a free resume evaluation today from the experts at Monster's Resume Writing Service. You'll get detailed feedback in two business days, including a review of your resume's appearance and content, and a prediction of a recruiter's first impression. Let the experts at Monster show you where your weak spots are and how to correct them—before you apply to jobs.